How many dogs are in this picture ??? Re: Who finds the other dog ? hi Pinoy51! I am so happy to see how pretty Sally has become. Is that Reyna under the bench? Adorable bunch!!!! Sorry for the late reply, currently travelling. This is Teddy under the bench, he likes to play with the two females but Simba is yealous and don't let him come close, once he is around too. Teddy is the grandson of Sandy my second rescue and the close friend of Reyna. I'm very proud of Sally and her recovery. Although I still have to do another round of blood testing and get her of the Ivermectin after I returned home. I hope that this time her immune system will be strong enough to keep the regular milbe population down which is left on her, as every healthy dog is able to do. I can't keep her on Ivermectin any longer without increasing the risk for her liver to be damaged. Congrats again on the wonderful progress you have helped Sally make. She looks great. i got the blood test finally done and getting the results tomorrow. I'm a bit nervous that there is something wrong with her liver after 4 months being on Antibiotics. 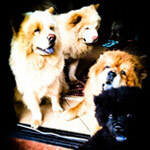 The three Chows are inseparable. They're always together and never fight. I can't leave the house with only one or two and I have to bring all three. They love car rides, too funny when they compete who can go in first and who can come out first. I bought an action camera finally, hope I can catch some of those moments and share it here.